Keeping your home clean needs to have an extra effort. And having a spotless carpet is included. Carpets can add up attraction in any place of your home and keeping them clean is necessary. Maybe you already start looking up about cleaning tips online and planning to do some clean-up this week. But how will you know it’s already the right time to have a carpet steam cleaning Perth? Is it before the holidays? When your relatives are coming and stay for the summer? Or when you just feel like doing it? Whether you are planning to hire a home cleaning service provider or do it all by yourself, scouring your carpet is considered as a tough task. Well, who knows when was the last time it’s cleaned, eh? We all know that people are busy at work or you just really don’t find cleaning as a fun thing to do. Just so you know, it’s not necessary to clean it every single day. All you have to do is to check some indications saying that you really need a clean-up soon. To help you, we have listed down 3 signs to consider when you should start cleaning your carpet. 1. Your allergy is getting worse. When you start getting runny nose because of your allergy, you already know what that means. 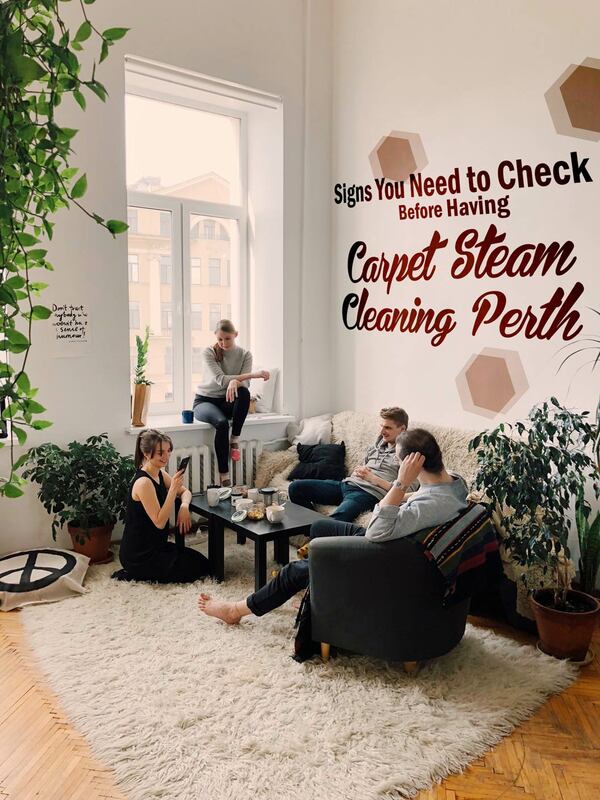 Isn’t it obvious that you need to have a carpet steam cleaning Perth for that matter? Maybe you never noticed that it has been a year since the last time you vacuum it. And you have been ignoring this sign because you thought it’s just the weather or something, but guess what? The main cause why your allergy is getting worse is because of your dirty carpet. You’ll never know what else is on it but you need to get rid of the dirt as soon as possible for the sake of your health. You also have to consider your loved ones’ well-being who has allergies with the dust if you don’t happen to have any. 2. Stubborn stains and funny odours are getting obvious. You can never avoid your carpet getting stains especially if you are a party person or your home is a place where everyone who is close to you hangs out. It may be the red wine you accidentally spilled last Friday night. Your nephew’s milk splashed when she got her tantrum last Sunday. And even the stains of a sliced of pizza left when it got flattened when your brother accidentally step on it. These are just a few scenarios that can ruin your carpet. So obviously, you’re in need of a carpet steam cleaning Perth when these things happen. 3. Blight and dust are already conspicuous. Fallen hair, dogs’ fur or your muddy shoes are some inevitable dirt that you can see on your carpet. Keeping it clean all the time is almost impossible. However, you can avoid too much dust and mildew by frequently vacuuming it and washing the stains right away. Doing a carpet steam cleaning Perth can make it look good as new. And with these signs that we have discussed above, you can check if it’s the perfect time to do some clean-up on it. You can do a regular vacuuming to prevent you from doing it the hard way. And as soon as some dirt or stains occur, try to wash or brush them up right away. It can lessen the time you need to spend in brushing, washing or vacuuming the carpet. But not just only that, it will also save you from spending too much money on a carpet steam cleaning Perth services. Having a hard time doing a clean-up? Maid in Perth is here for you! We have awesome deals and great services that will suit your cleaning needs. Feel free to call us today for more information about our services. You can also check our website for more helpful tips and hacks for your future tidying up plans. This entry was posted in House Cleaning and tagged Carpet Steam Cleaning, Deep Cleaning, house cleaning services, Maid in Perth.